Free bet of up to $250 for new sign ups. 3-5% rebates on all races, paid weekly. 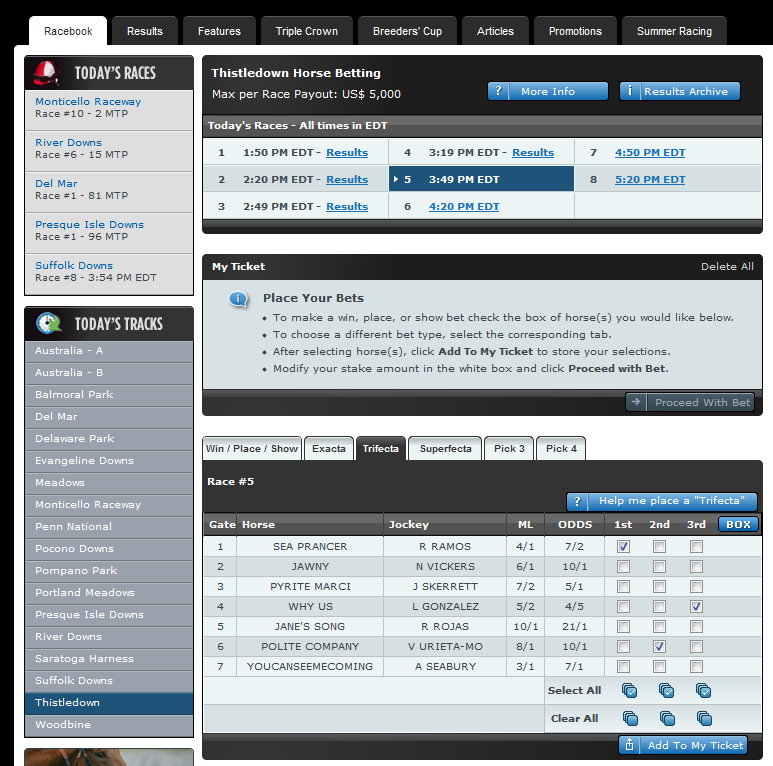 Easy to navigate and understand racebook layout. Bovada.lv is one of our top rated online racebooks for Americans looking to bet on horse races online. Bovada is the American facing sister site of the popular sports betting brand Bodog.eu. 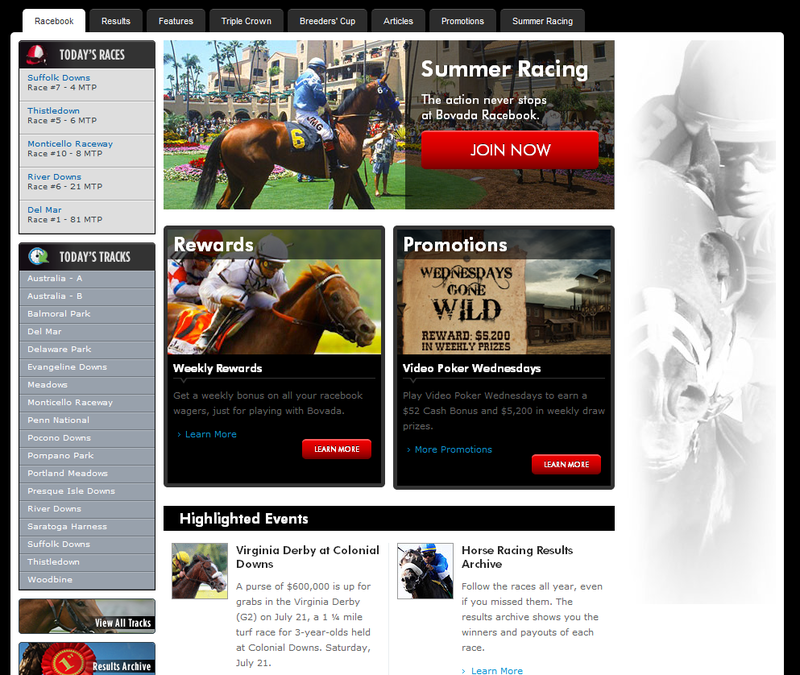 Bovada is a well respected and trusted racebook that gives back to their horse racing bettors with some great rebates. It is important to note that Bovada only accepts American residents. If you are from outside of the US I suggest checking out Bodog.eu, an equivalent site for non-Americans. Bovada offers new sign ups a free bet equal to 50% of your first deposit up to a maximum of $250. This free bet can be used at any time within 30 days of your deposit on any sport. The rollover for this bonus is three times the deposit + free bet amount. Make sure you don’t request a withdrawal before completing the rollover requirements or you will lose the bonus funds PLUS any money you earned by wagering the bonus dollars. Visit Bovada.lv now to claim your free bet! Receive a 3% weekly rebate on all of your straight bets (win/place/show) and a 5% weekly rebate on all of your exotic wagers. The rebates are paid on Tuesdays. Get double your rebate when placing bets on the Saratoga or Del Mar races on Wednesdays, Thursdays or Fridays. That means you get 6% back on straight wagers and 10% back on exotics! Click the race or track you want from the left sidebar to get to the betting section for that track/race. I clicked on the Thistledown Race #5 that you can see as the second featured race in the above screenshot. That brought me to the Thistledown races with race #5 selected. Check out the below screenshot to see this page and how the win/place/show bets are very easy to place. To place exotic bets such as exacta, trifecta, superfecta, etc, simply click on the tab beside the win/place/show tab above the horses. You can see below how the exotic betting layout looks after I clicked on ‘Trifecta’. 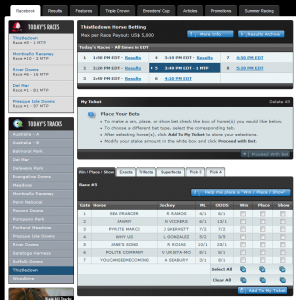 As you can see the Bovada racebook layout is very easy to understand and navigate making it very easy to place your horse racing bets online at Bovada.lv. You may have noticed in the original screenshot the ‘View All Tracks’ button in the left sidebar under todays racetracks. Clicking that link you can see the entire list of tracks that Bovada currently takes bets on. In total there are 84 tracks offered! 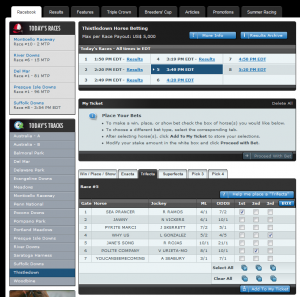 Visit Bovada.lv to bet on the horses at one of the many tracks available.